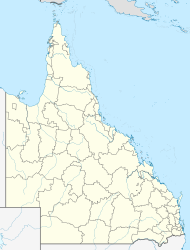 The Gap is a leafy and hilly suburb of Brisbane, in Queensland, Australia, located approximately 8 kilometres (5.0 mi) west of the Brisbane CBD. The Gap was named for its geographical location in the valley between Mount Coot-tha and Enoggera Hill (i.e. 'the gap' between hills) which both form part of the Taylor Range. Initially inhabited by the Turrbal people, The Gap was originally heavily forested. With the arrival of European settlement, timber felling became the first industry in the area, and with the removal of the timber the area was turned over to farming. The first crown lease of land was in 1851, to Darby McGrath who ran a sheep station across the entire valley. The first freehold land sale was made in 1858, to P.B. and J. Paten in the area where Paten road runs today. Access to The Gap in the 1850s was via tracks which became Waterworks and Payne Roads. They also provided access to Enoggera Dam which was built in 1866 to provide a water supply for Brisbane. Following World War I the area was broken up into smaller farms for returned servicemen, many of whom farmed poultry and dairy cattle. Many of these farms were too small to be commercially successful, however small pockets of farming remained in The Gap until the 1980s. From 1879 The Gap was part of the local government area called Ithaca Division, then part of the Shire of Enoggera from 1887 to 1925. Masons jam factory used to be located to the east of the Ashgrove Golf Course, but has not existed for the past two decades. A gold mine was located near the entrance to Payne Road Primary School. The billabong between The Gap State High School and Payne Road Primary School used to be a favourite swimming location and over the years has been home to turtles, eels and platypus. It was named Shepherd's Pool, supposedly after a shepherd who was killed by aborigines in 1852, although the name may derive from a P.A. Shepherd, who leased the adjacent land in the 1930s. There used to be a toll gate located on Waterworks Road near what is now the entrance to Brisbane Forest Park. The Gap War Memorial is located at Walton Bridge Reserve and commemorates those who served in World War I and World War II. The Gap was affected by a major storm on the afternoon of 16 November 2008. A microburst hit The Gap with extremely high winds, causing many trees to fall onto homes and major roads, as well as causing many houses to lose their roofs. The district was later subdivided into blocks of land for housing estates. The recreational activities of inhabitants of the suburb are well catered for, with many facilities including many sporting clubs (Soccer, Tennis, Athletics, Swimming and Golf etc.) and there are a number of lush green parks. The Gap is also where the main entrance to Walkabout Creek, in what was previously known as Brisbane Forest Park, (now officially the southern part of D'Aguilar National Park), is located. 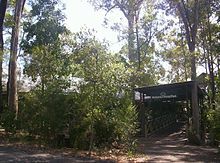 A major bushland area in Brisbane's west, there is an information and wildlife education centre, with many Australian wildlife species, including marsupials, birds, fish and reptiles. For a number of years, now, there has been a resident platypus named Burrun at Walkabout Creek and, more recently, a second platypus named Willum (Burrun's half-brother). Bred at Healesville Sanctuary in Victoria, they are the sons of Barak, the platypus at Lone Pine Koala Sanctuary. 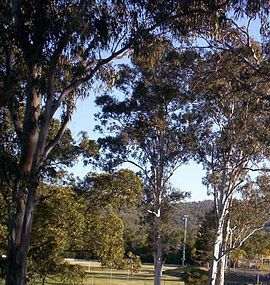 Ashgrove Golf Club is located in the Brisbane suburb of The Gap, at 863 Waterworks Road. Ashgrove Golf Club was formed in April 1939 as a nine-hole format. Over time the club expanded to eighteen holes utilizing freehold and leased land. The land was originally a dairy farm and market garden. Mark Winston was the original owner who leased the land to the club until the club bought the land in 1950 for ₤12,000. The club celebrated the 75th anniversary of the formation of the club with a week-long celebration of golf and social events in April 2014. The suburb has a small shopping village (which extends from Walton Bridge Reserve to The Gap State High School and Payne Road State School). There are also Christian churches of many denominations, as well as a local Police Station in the suburb. Ashgrove Fire Brigade, which is at West Ashgrove, is also in close proximity to The Gap. Also, an ambulance station has now been opened close to The Gap. The Gap is served by a fortnightly visit of the Brisbane City Council's mobile library service at the car park in the sports ground at the end of Glenaffric Street. The Gap State High School (public state school). This school was opened on 25 January 1960. The Gap State School (public state school). This school was opened on 22 January 1912. Hilder Road State School  (public state school). This school was opened on 30 January 1979. Payne Road State School (public state school). This school was opened on 27 January 1970. Travel to, and within, The Gap is by road. As well as private vehicles, The Gap has a good public bus service. The main arterial road through The Gap is Waterworks Road, which heads east through the suburbs St Johns Wood, Ashgrove and Red Hill and then, as Musgrave Road, it continues to Brisbane city. Waterworks Road was widened, from two lanes to four lanes, along the 8 kilometres (5.0 mi) stretch of road between The Gap and Red Hill between July 1999 and December 2003. Total cost was $50 million. In 2009, scenes for the feature film Jucy (2010) were shot in the suburb. Robert Forster (musician), one of the founding members of the musical group, The Go-Betweens, grew up in The Gap and wrote about the suburb in his 2016 memoir, Grant & I.
David Malouf's novel "Johnno" references The Gap on two occasions, as does the debut novel of journalist Trent Dalton, 'Boy Swallows Universe'. ^ Australian Bureau of Statistics (27 June 2017). "The Gap (Brisbane - Qld) (State Suburb)". 2016 Census QuickStats. Retrieved 13 April 2018. ^ "The Gap Ward". Brisbane City Council. Brisbane City Council. Retrieved 19 March 2017. ^ Larsen, Jim. "St. John's Woods memories". St Johns Wood, Ashgrove. Archived from the original on 6 June 2014. Retrieved 3 June 2014. ^ Dayman (nee Peake), Joan. "St. John's Woods memories". St Johns Wood, Ashgrove. Archived from the original on 6 June 2014. Retrieved 3 June 2014. ^ a b "Payne Road SS". Archived from the original on 2 February 2017. Retrieved 28 January 2017. ^ "The Gap War Memorial (Brisbane)". Wikimapia. Archived from the original on 7 April 2014. Retrieved 6 April 2014. ^ "SEQ Severe Thunderstorm and Microburst at The Gap". Australian Government: Bureau of Meteorology. Archived from the original on 29 March 2012. Retrieved 7 October 2011. ^ indoorlightening (18 November 2008). "The Gap cyclone of November 16 2008 - Brisbane Qld Australia". Archived from the original on 31 January 2017. Retrieved 1 December 2016 – via YouTube. ^ a b Ashgrove Golf Club Diamond Jubilee. Ashgrove Golf Club. 2014. p. 1. ^ "Mobile library services". Brisbane City Council. Archived from the original on 6 June 2014. Retrieved 3 June 2014. ^ "Hilder Road SS". Archived from the original on 2 February 2017. Retrieved 28 January 2017. ^ "School website". St Peter Chanel Catholic Primary School. Archived from the original on 27 April 2014. Retrieved 26 April 2014. This page was last edited on 19 April 2019, at 04:38 (UTC).